How many times have you cut the grass with your lawnmower? Whether you push the mower or ride, have it powered by gas or electric there is always a great sense of accomplishment once the job is done. It doesn’t hurt that the lawn looks great, too! Although that lawnmower might have served you very well over the years it won’t last forever. When it’s time to say goodbye to that piece of equipment the best call you could make would be to Junk King Columbus. These are the junk removal professionals that can make any large object disappear. An old lawnmowers is something that you can’t easily get rid of. That’s why you find many garage is around Columbus that might have an old mower tucked away in a corner taking up valuable space. Would you even know where to drop off an old lawnmower? You won’t have to worry about that when you hire Junk King Columbus. They’ll send over a team of movers and a big truck that will be capable of holding that lawnmower. They also know exactly where to take it. It’s a safe bet your lawnmower could end up at a recycling center. That’s part of Junk King’s dedication to keeping the environment around Columbus as clean as possible. If they can avoid going to a landfill, then that’s exactly what they are going to do. 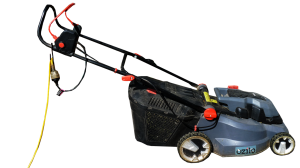 Even though your focus might be on getting rid of that old lawnmower there’s no reason why you can’t get rid of the rest of your unwanted clutter the same trip. You’ll always have at least to Junk King crewmembers assigned to the task. They won’t mind going down into your basement to bring up old furniture or climbing up to the attic to bring down any other rubbish items you have in storage. Just think of how much space you open up around the house once the session is complete. Scheduling with Junk King is easy. You can set up your appointment over the phone or online. All you need to do is pick the day and two hour window of time that works best for you. If your junk is ready to go, then Junk King might even be able to swing by on the same day. The best way to take care of an old lawnmower disposal and junk clearing is to turn the job over to Junk King Columbus today. This entry was posted in columbus junk removal and tagged Junk King, junk removal, lawnmower, rubbish on September 25, 2017 by Junk King. Last updated September 25, 2017 .